In my secret life with my secret interest.. like overweight anonymous! If at all possible, I believe it to be a Very Good Idea to make something from start to finish. Then it can be put in the jar. Here we have mayonnaise, in two versions -lemon mustard and garlic. It is actually a very satisfying thing to make. I used a blender but I have heard it is just as simple to make whisking by hand. After you see how much oil is in it you will monitor your mayonnaise intake. whisk or blend these ingredients together. Slowly add oil drop by drop or a very slow narrow stream… the amount? about 3/4cup of light vegetable oil like sunflower or safflower. I have tried olive oil and it was a little heavy tasting. But the neat part of making this is the texture. For the garlic mayonnaise add crushed garlic! (amazing huh?) to the whipped mayonnaise. other variations are mustard added, more salt, or sugar. There are millions, or quite a few anyway, recipes. The point is to try it out. 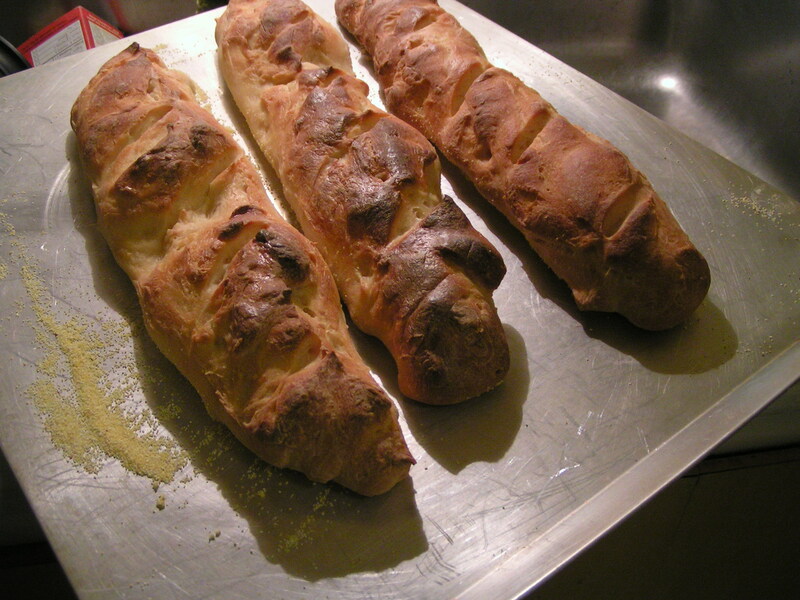 Having recently been in France, I just had to try making the bread for LoML who gallantly stayed home… to look after the cat. The pan of boiling water in the bottom of the oven is the reason for the crunchy exterior. let this sit in a warm place until the yeast starts to bubble. Add flour 1 cup at a time stirring it until smooth. It starts getting hard to stir around the 3 cup of flour. Using your hands or the dough hook on a hand mixer add the 4 cup of flour. The dough should be a little sticky still at this point. If it isn’t sticky then that is enough flour. This amount of water can take up to 7 cups of flour depending on a number of factors…humidity, temperature, kind of flour. You do want a dough that is just past sticking to your hands. Knead out on a flat surface until it has a satiny sheen and is elastic in texture. Put the rounded ball of dough in a bowl that has been greased. 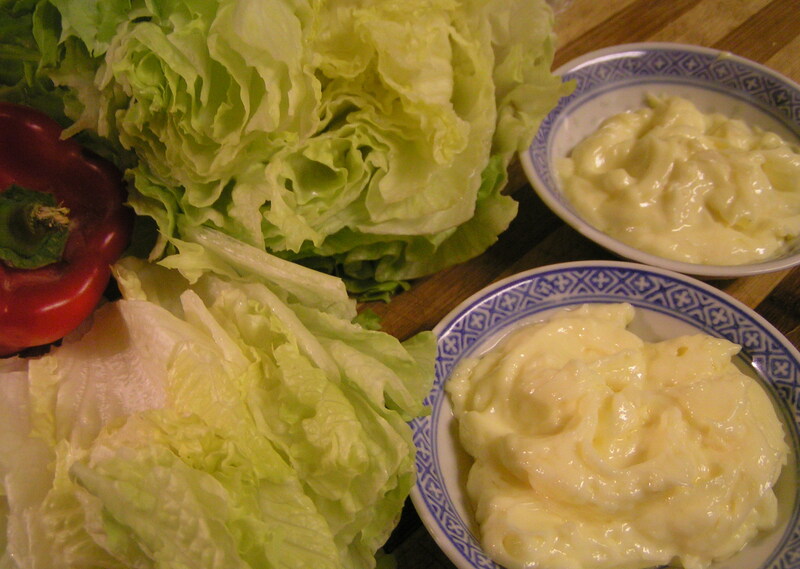 (vegetable shortening or lard) roll it around to lightly cover the surface. Cover with a plastic bag to minimize draft. Leave to rise to double the volume in a warm place. This takes about 2 hours. Punch the dough down and divide into 4 equal pieces. Shape them into elongated rolls and score the tops with a sharp knife. Place them on a baking sheet that has a dusting of corn meal. Cover with the plastic until they rise to almost double. This is around 1/2 hour. Turn the oven to 425F and place a pan of boiling water at the bottom of the oven. There baguettes and mayonnaise. Life, my darling, is good. ~ by Elaine Berglund on 01/02/2010.